Here’s what to do with the leftover Christmas ham: Add it to lots of good-for-you cruciferous vegetables. We think that the ideal pairing is Brussels sprouts. The recipe is from PorkBeInspired.com, the consumer website of the National Pork Board. You can serve it as a main or a side. Frizzle means to fry or grill with a sizzling noise. Frizzling is a technique used to crisp strips of cold cuts—bologna, ham, roast beef, turkey roll, etc.—in a frying pan. The crisped slices curl up like bacon (and you can substitute bacon for other frizzled meats). Frizzled meat can be added to scrambled eggs and omelets, sandwiches, grains, vegetables, salads, as a soup garnish, etc. Prep time is 30 minutes; cook time is 20 minutes plus 10 minutes resting time. When you frizzle ham, you cook it like bacon. Photo courtesy PorkBeInspired.com. *The highly nutritious, anti-carcinogen Brassicaceae family of vegetables is also called the Cruciferous family, from cruciferae, New Latin for “cross-bearing.” The flowers of these vegetables consist of four petals in the shape of a cross. The family includes arugula, bok choy, broccoli, Brussels sprouts, cabbage, cauliflower, collard greens, horseradish, kale, kohlrabi, mizuna, mustard, radish, rapeseed/canola, rapini (broccoli rabe), rutabaga, tatsoi and turnips. Eat up! †If you don’t have shallots, substitute sweet onions. You want mild onion flavor in this recipe. 1. 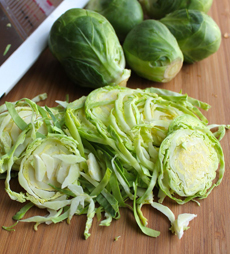 SLICE the Brussels sprouts in batches, placing them in the feed tube of a food processor fitted with a thin slicing disk. If you don’t have a food processor with a thin slicing disk or a mandoline, thinly slice the Brussels sprouts by hand. 2. ZEST the orange, then squeeze the juice, measuring out 1/4 cup for the recipe (save any remaining juice for another use). Set the Brussels sprouts, orange zest and orange juice aside. 3. WARM the olive oil in a large saucepan or small stockpot over medium heat. Add the ham and cook, stirring occasionally, until crisped and golden, 3 to 4 minutes. Use a slotted spoon to transfer ham to a plate and set aside. 4. ADD the butter to the pan and melt over medium heat. Add the shallots and cook, stirring occasionally, until almost translucent, about 3 minutes. Add the garlic and cook, stirring occasionally, for 1 minute. 5. STIR in the Brussels sprouts; then stir in the orange zest and orange juice. Cook, stirring occasionally, until the Brussels sprouts are tender, about 8 minutes. Remove from the heat and stir in the pine nuts and vinegar. Season with salt and pepper. 6. 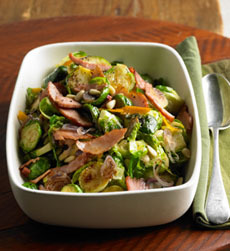 TRANSFER the Brussels sprouts to a serving bowl, top with the ham and serve.